How to make Whole Wheat (100%) Pie Crust - Our Sunday Cafe, the Retirement Edition! Little by little I have been converting our food, baked goods in particular to whole wheat flour. I have been pleased with the outcomes, which has inspired me to continue on and try additional recipes. Today was a big step, whole wheat pie crust. 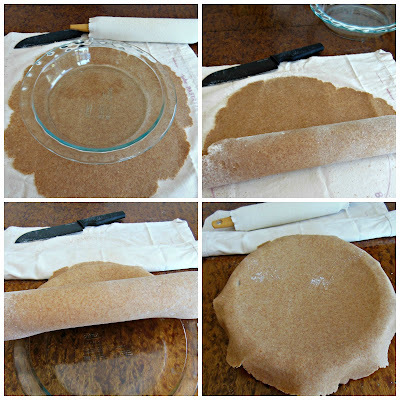 I have been using the same pie crust "recipe" if you will for many years. It is my best guess as to the crust my dear grandmother made. Only she did not use a recipe, she simply opened cupboards, and before you knew it, a pie was in the oven. Or so it seemed. You know things always seem magical when our grandparents are making something! When I made the decision to change out the flour in my pie crust, I searched for a new recipe. One that possibly had been formulated for whole wheat flour. Then I realized how off the wall that thought was. In reality, there is flour, whether it is whole wheat or all-purpose and from there, you bake. You would (if needed) formulate a recipe specific to a flour type as you continue to bake if you want a different outcome. I also thought this would be a good time to adapt my recipe to the food processor for working the butter into the flour. The only way to know that my favorite pie crust recipe might need a change was to make pie crust. So I did.....but keep in mind, this is also perfect to do by hand! Place flour, salt, and sugar into the processor bowl. Top with 2/3 of the sliced butter. Pulse to make coarse crumbs. Note: if working by hand, add all of the butter to the flour at one time, you will naturally develop pieces of butter of different sizes, which is how the flaky texture is achieved. Place the vinegar into a cup with some ice cubes and cold water, set aside. Add remaining butter to the processor bowl, pulse on and off to work the remaining butter into the flour. There will be some larger pieces of butter, which is fine. Using a measuring tablespoon, with the processor running, begin adding the iced water to the flour-butter mixture, one tablespoon at a time. 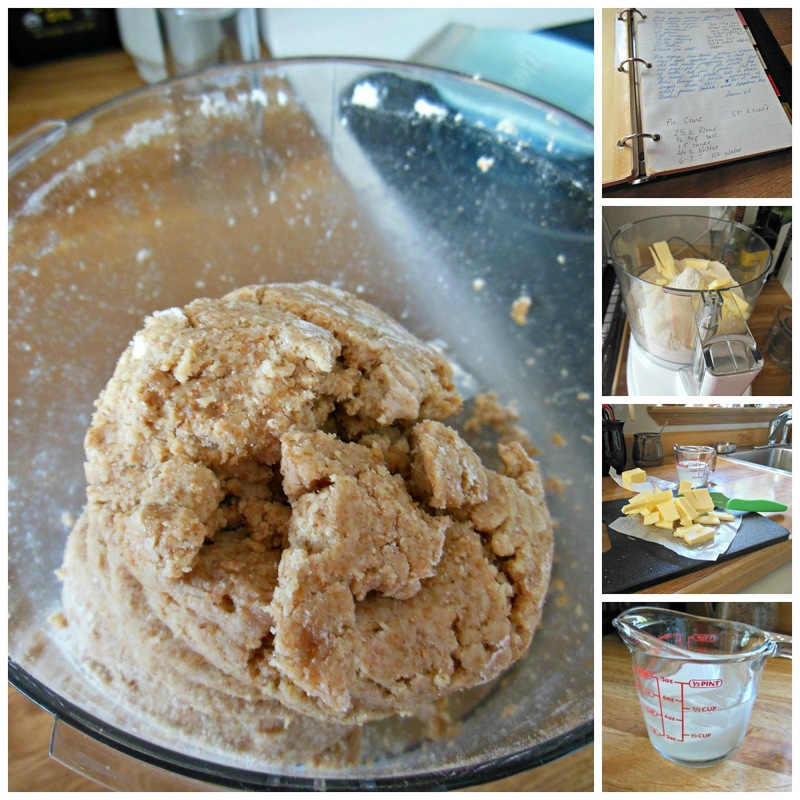 Continue adding the water until the dough begins to cling together and form a ball. IMPORTANT: do not use more than 7 tablespoons of water total. Remove dough from processor, toss with a bit of flour to make it easier to work with. If you only need one 9 inch crust, wrap half of the dough onto plastic wrap, place in a freezer container and freeze for future use. 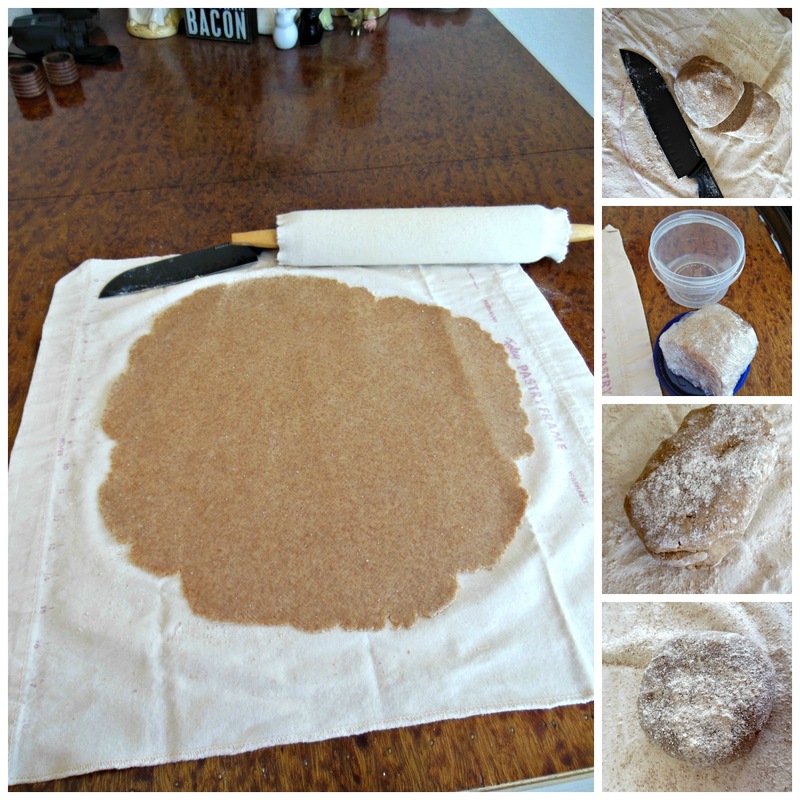 On a floured surface (I prefer a cloth pie sheet and a stockinette cover on the rolling pin) roll out the dough by alternating the direction of the rolling pin, rolling out until the dough is approximately 1 1/2 inches larger than the pie pan. Roll the dough over the rolling pin, carefully lift the dough, and unroll the dough over the rim of the pie pan. Gently fit the dough down into the bottom and sides of the pie pan, taking care not to stretch the dough or rip it. Turn the excess dough under along the upper rim, seal by pinching between your thumb and forefinger, flute the ridge of dough in an attractive pattern. Now you are ready to bake a pie. And it turned out delicious! That is a lovely pie! I've got to use more whole wheat in my baking! That looks like a success! I tend to use King Arthur's white whole wheat for pie crusts, but yours looks like it came out perfectly. Sorry I was so late getting here this week -- we were off camping and had almost no internet connection. Delicious thanks for sharing with Hearth and soul blog hop, pinning. I am intrigued with your use of the cloth pie sheet and a stockinette cover on the rolling pin! How quaint! First time ever looking at them. I came looking for your pie crust recipe!